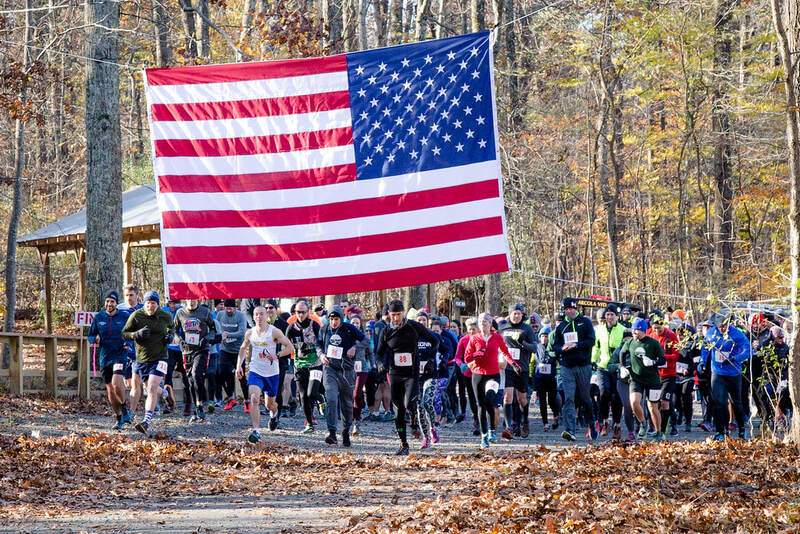 What a wonderful morning we had on Veterans Day for our 7th Annual JSMT10K! In 2017, Loudoun Road Runners renamed the Loudoun 10K Trail Race the Jim Schatz Memorial Trail 10K in honor of our founding race director and club member extraordinaire, Jim Schatz. Each year since it's inception, the weather has been glorious -- cold perhaps -- but never rain. This year was an amazing day shared with all those who participated for a common goal -- to run or walk the trail course with fellow runners, family and friends -- and to raise money for Boulder Crest Retreat. Thank you to all the runners who gave it their all and endured the muddy trails along this challenging, yet scenic course, through the landscape of Camp Highroad. You are true warriors! Thank you to our headline sponsors, Toth Financial and IT Concepts. Thank you to our other sponsors: INOVA, Commonwealth Emergency Physicians, Dirt Farm Brewing Co., TCB Associates, Catoctin Coffee, Two Hands in Harmony Pottery, and a big thanks to our anonymous and individual donors! Thank you to the Arcola Volunteer Fire Department. They provide medical assistance and support for our race each and every year! Thank you to our race director, Allison Abbe, our race committee and to all the Loudoun Road Runners and volunteers who gave their time and expertise that contributed to the success of our race! Thank you to Ken Falke, Founder, Boulder Crest Retreat, for participating each year and your kind remarks during the opening ceremonies. We so appreciate you and your staff and we look forward to a continued relationship with you and your team. Because of everyone's generous support we raised $31,000 for Boulder Crest Retreat! We also want to thank all those who have served and continue to serve in our military to defend our country. We support you and are grateful for your service! PARKING is free at Camp Highroad, 21164 Steptoe Hill Road, Middleburg, Virginia. Look for direction from race volunteers once you get on Steptoe Road. THE RACE starts at 9:00 am, after an opening ceremony at 8:30 am. We time this race manually, so please make sure your race bib is visible on your chest. THE COURSE is hilly and may be muddy. Come prepared for challenging, though not highly technical trail conditions. REGISTRATION is $45.00 and includes a technical race T-shirt. PACKET PICKUP is only available on race day at Camp Highroad's Poplar Lodge. Please try to arrive by 8 am to give yourself time to park and get your packet before the race starts. Also note that there is no official bag check. You can leave your gear in the Poplar Lodge, but it will not be monitored by a course volunteer. AWARDS will be given to the top three male and female finishers and the youngest and oldest finishers. 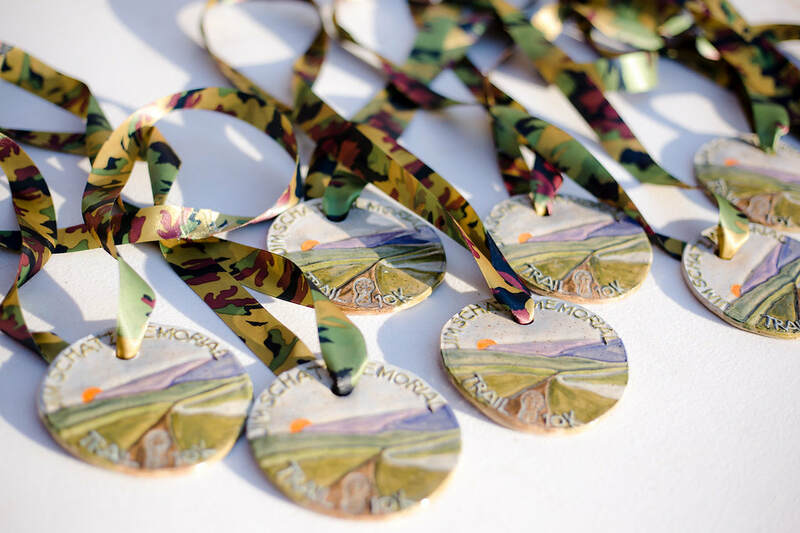 Top and age-group winners will receive a hand-made ceramic medal from local runner and artist Pat Miller. RESULTS will be posted online within 1 to 2 days of the race. PHOTOS will be posted online within 1 to 2 weeks of the race. 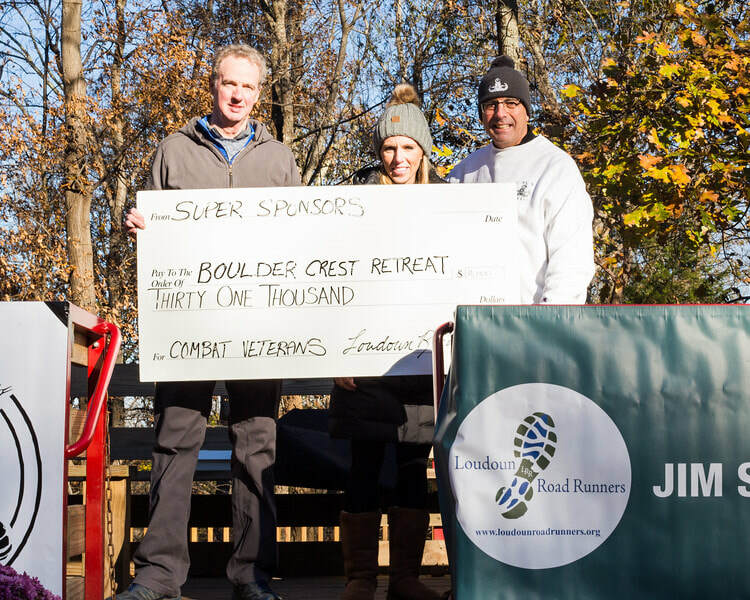 PROCEEDS of the race will go to Boulder Crest Retreat to help U.S. military vets recover from the emotional and physical scars of war. We are grateful to the runners, volunteers, and sponsors who have helped us raise more than $100,000 in donations since our first trail race. ADDITIONAL CHARITABLE DONATIONS to the race are gratefully accepted and are tax-deductible. These may be included during online race registration or conveyed by personal check. QUESTIONS? Please check our Facebook page for race updates or contact us here.